I imagine any middle school or high school reader with an eye towards mythological books or movies know the basic plot of THE LIGHTNING THIEF, a best-selling novel by Rick Riordan that was turned into a Hollywood movie last year. Percy Jackson, the half-blood son of Poseidon, must find and return Zeus' stolen thunderbolt before an epic battle between the Greek gods erupts, causing mayhem and destruction on Earth and Olympus. 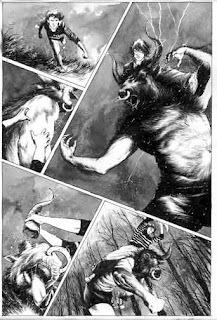 Now Robert Venditti has turned the novel that became a movie into a graphic novel. I have some bias here, since I loved the book (and was not quite as smitten by the movie) and have taught it as a novel to my sixth graders. While the graphic novel is good, it just doesn't hold up to the book. Like the movie, the graphic novel never quite gets the reader in the head of Percy Jackson, whose narrative voice holds the entire story together. And, in a move to condense the story, the graphic novel jumps through events or leaves them out altogether (what, no Medusa?). 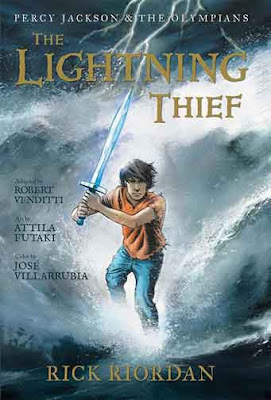 This is not a bad book; it's just that I think THE LIGHTNING THIEF is a story made for an engaging graphic interpretation, and this one falls short. The strongest element here is the artwork by Attila Futaki and Jose Villarrubia, particularly when Percy is having his dreams that lay the foreshadowing for the story unfolding all around him. There is an eerie quality to these moments. And the Oracle of Delphi is quite unsettling, as she should be. The panes of the graphic novel quiver with strangeness. The Underworld and Olympus, floating high above New York City, are also impressive. I imagine there are quite a few of my students who will line up to read this book, and you may have those same students in your classroom. It would be interesting to have a three-way comparison between the novel, the movie and this graphic novel –– all have some differences, and to make those differences visible would be an interesting assignment for lovers of The Olympians series. I recommend this book for upper elementary and middle school classrooms, but not as a replacement for the original novel. It can be a nice supplement. There is some violence in the story, as Percy and his friends battle monsters, but nothing too alarming.